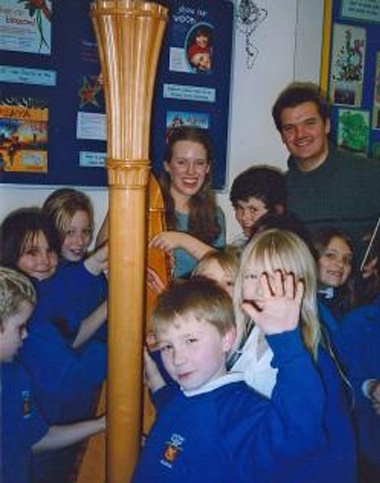 Harriet has over ten years of experience teaching the harp to all ages and all ability levels. She teaches both pedal and lever harps and has both at her home in Battersea, SW London, so there is no need to bring your harp with you to lessons! Currently concentrating on her thriving private practice, Harriet has also been the harp teacher for Brunel University. She is passionate about education and outreach work, having performed for several years with the charities Music in Hospitals and Vital Arts. Harriet is also an experienced workshop leader and has performed in workshops across the country for children of all ages, both as a harpist and as a composer. Once a student has decided to learn the harp, Harriet is able to advise on the best harps to hire or purchase, bearing in mind the age (and size!) of the student and also their available budget. Whilst harps are not cheap, there are plenty of options to make them more affordable, including private hire and second hand instruments. Harriet has a 100% success rate with ABRSM exams, with all her most recent exam entrants getting high distinctions. She supports her students in performing at festivals and competitions, although there is no pressure to do so if they are not keen on the idea. As an active performer, Harriet also encourages her students to attend harp concerts and to come and see her in action! She believes in making lessons fun and informative, with a particular emphasis on teaching solid technique. Lessons will cover exercises and scales, pieces, and sight reading, and in addition will also cover general musicianship, performance practice, and aural awareness. With younger students there is also the opportunity for 'musical games', learning through play and developing their musical imagination.